This member of the pouter family is a combination of the German Swing (Steller) and the Czechoslovakian Swing (Stavak). Among the marking variations is the magpie or gansel. In the United States this marking phase has become the bird known as the Bohemian Pouter. This pouter should reflect a feeling of health and vitality. 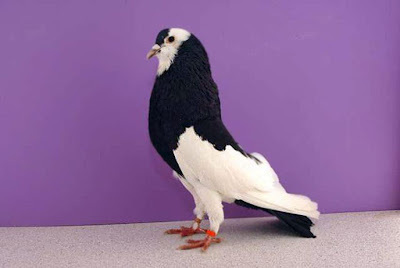 Originally a free flying breed it should still appear ready and able to maintain a graceful flight. The Bohemian has a strong body, well developed globe, magpie markings, and deep, rich color.